We ate out three meals in Moab with the first being dinner at the Sunset Grill, which is perched on a cliff providing some nice views of the valley - the building is the former home of uranium king Charlie Steen. Even the area clouds make arches. Other than a Chinese restaurant, I’ve never ordered duck but after the waiter recommended it, I gave it a try. It was topped with raspberry sauce and served with rice and vegetables. The same waiter above recommended the Moab Diner for breakfast so off we went the next morning. Mine was pretty good with excellent hash browns, pretty good gravy, but an overcooked biscuit - Bev loved hers and Pat had French Toast which she enjoyed. We liked it enough to go back the next morning when Bev and Pat got the same thing and I ordered a Moab Diner's Sweetwater Skillet: “The Original: Definitely our house specialty! A blend of fried potatoes, bacon, diced green onion, bell peppers and melted cheese all of which is spiced just right and topped with two eggs any style. Served with toast and jelly.” $6.75. Sorry, no pictures today but it was very good. Since they advertise the best green chile in Utah, I said smother it (Just say “Smother it!” and we'll top your skillet with the Diner's famous Green Chile for just 1.25.) I can’t comment on their boast as this was my only Utah green chile, but it was so good, we bought a quart for the road. This was send to me by a Bill at “My Wonderful World” (http://whstoneman.blogspot.com/) and after hardy laugh, I decided I’d have to type it up for posting – thanks Bill I needed that. An elderly Florida lady did her shopping and, upon returning to her car, four males in the act of leaving with her vehicle. The four men didn’t wait for the second threat. They got out of the car and ran like mad. She tried and tried, and then finally realized why. It was for the same reason she had wondered why there was a football, a Frisbee, and two 12 packs of beer in the front seat. A few minutes later, she found her own car parked four or five spaces down. The sergeant to whom she told the story couldn’t stop laughing. If you’re going to have a senior moment . . . make it memorable. Our first day in Moab was spent in Arches NP and just getting into the park is interesting as it involves a switch-backing road from the valley floor up to the top of the mesa – I couldn’t believe the big tour buses made the trip. I took 110 shots and tried to boil them down to 20 representative of the park. 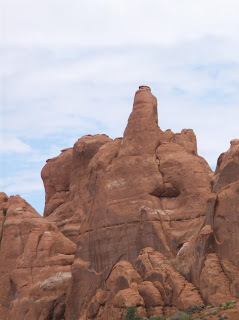 While many folks would make arduous hikes to see some of the arches, I found many of the other formations even more fascinating. Arches and Canyonlands pretty much began the same, as the Colorado Plateau with similar underlying rock structures put down over the eons. Water pretty much formed the things we now see in each park but where it was rivers in Canyonlands, it was just rain (and ice) in Arches. These days, we would likely have a fleet of guvment experts out there trying to figure out how to stop the erosion from occurring. I would sum up Arches as a vast erosive desert wasteland containing many scenic wonders continually sculpted by Mother nature over the last 100 million years. If you disagree with my assessment, consider this. After three days in Victor, ID (visiting Jackson Hole), we spent two days driving down to Moab Utah. We spent the night in the KOA in Salt Lake City and it was pretty typical for a big, in-town KOA – nice but tight. The most interesting thing about the trip for me was the difference in landscape from the wheat fields of Idaho (saw way more wheat than potatoes) through the mountains of northern Utah, and into the near moonscape south of them. Shortly after getting on I-70 we made a fuel stop in Green River, where a lady had a melon stand that even the semis were stopping at. Bev said we still had a melon and pasted on these only to be told by Pat a few miles down the road that Green River is noted for its melons – she’d done a web search. Surely we can find them 50 miles away in Moab. We turned off I-70 onto US-191 and after some more dessert we dropped into the red rock canyons around Moab – reminded me of Sedona, AZ. We stayed at the Portal RV Resort which is comprised of a campground and a resort where the sites are owned and rented out by the resort management. We stayed in a yet to be landscaped spot in the resort, which turned out perfect for the dogs. Upon arrival, the campground was full due to an Airstream rally be held there but it looked different the next day with only one remaining. The finished part of the resort had some very nice spots with a Koi pond in the center. We’d been having the heaters come on during the night and I thought they did our first night in Moab as well, but it turns out it was the A/C and when I went out in my normal warm up suit I was way over-dressed. This is the rocks west of us as the morning sun lights them up. We began the second day in the Teton area by splitting a huckleberry shake from the Emporium in Victor. Then we drove over the mountains and into the Grand Teton National Park (NP) for scenery and wildlife viewing. Getting from Victor to Jackson Hole required a trip over the 8431’ Teton Pass and this is a shot into the Jackson Hole area from the pass in the morning. And this is from the pass on the way back to Victor in the afternoon. We took the Moose-Wilson road (some was gravel) and our first stop was a drive through the base of Jackson Hole Ski Area where we had spent some happy times in our younger days and as expected the base area had grown a lot. Shortly thereafter, we enter the NP as the road continued along the east base of the Tetons. They are a unique mountain range as they spring up 5000 to 7000 feet above the valley floor without the foothills common to most mountain ranges. We’d hope to see a bear and a moose but while there was no bear, a beautiful red fox ran across the road in front of us and we did see moose. This mother and calf were standing in a classic moose habitat. Others were enjoying them as well and this was the highlight of the day. We continued on and were soon at Jenny Lake. Son Eric, who had spent a couple of summers working in the area advised that Jackson Lake Lodge was a must see while we were there and upon arriving we were underwhelmed with the architecture of the lodge, especially compared to those at Old Faithful. But when we went up to the second floor and looked out the back window we saw the must-see. These were from the back deck where a wedding had just taken place (folks were arriving for another wedding as we left) – Mt Moran is the dominant feature. The above shot would have been much prettier had Jackson lake not been so low as seen in this shot of the marina boat launch. From there, we drove back to Jackson for a late lunch at Bubba’s BBQ, which had converted itself from a great place where the locals ate into a bigger place across the street serving expensive food to the tourists. I’m sure they are making way more money, but while the food was pretty good, I much preferred the original (with the cop cars parked outside) that we had visited in our skiing days for cathead biscuits and sausage gravy. On a sad note: I'm a Tennessee and West Virginia football fan.